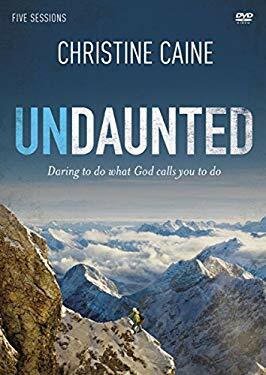 Part inspirational tale, part manifesto to stir you and your small group to lives of adventure, Undaunted shows the way to redemption that is found when faith becomes action. Ultimatley, this compelling six-session video based study offers life-transforming insights about how not only to overcome the challenges, wrong turns, and often painful circumstances we all experience, but also to actually grow from those experiences and be equipped and empowered to help others.Using her own dramatic life story, Caine shows how God rescued her from a life where she was unnamed, unwanted, and unqualified. She tells how she overcame abuse, abandonment, fears, and other challenges to go on a mission of adventure, fueled by faith and filled with love and courage.As Christine tells of how she realized the significance of her own life and choices, she will inspire you and your small group to grasp lives that bring hope and create change for Christ. Used Very Good (1 available) Used DVD. 100% Money Back Guarantee. Shipped to over one million happy customers. Support Literacy! Your purchase benefits MAYWOOD PUBLIC LIBRARY!